From transforming the ways of war to offering godlike views of inaccessible spots, revolutionizing rescues worldwide, and providing some of our most-watched TV moments—including the cloud of newscopters that trailed O. J. Simpson’s Bronco—the helicopter is far more capable than early inventors expected. Now James Chiles profiles the many helicoptrians who contributed to the development of this amazing machine, and pays tribute to the selfless heroism of pilots and crews. 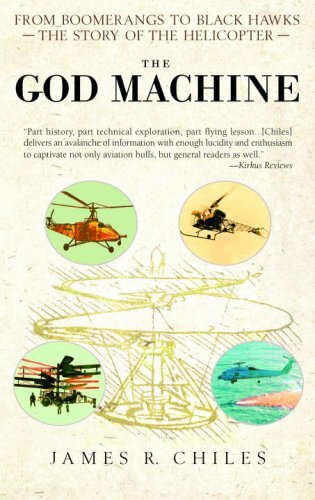 A virtual flying lesson and scientific adventure tale, The God Machine is more than the history of an invention; it is a journey into the minds of imaginative thinkers and a fascinating look at the ways they changed our world.